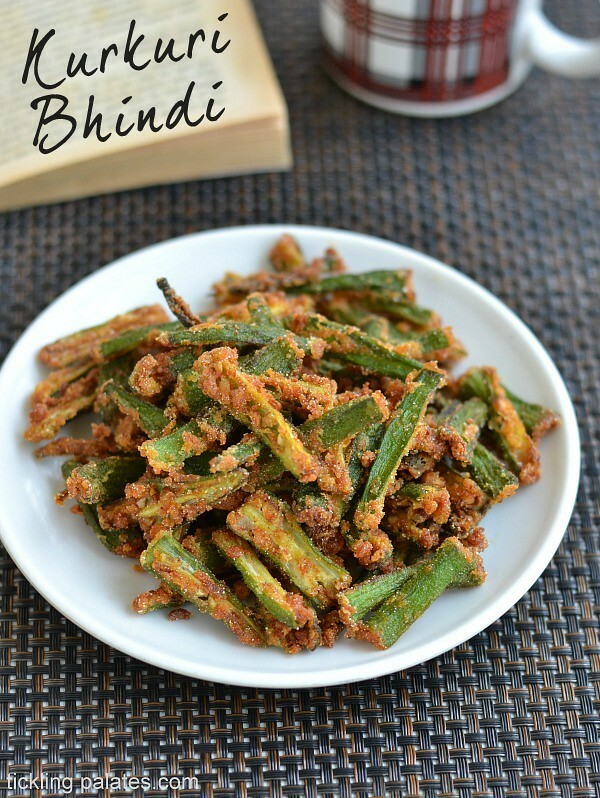 Kurkuri Bhindi Recipe or Crispy bhindi (okra) fry with step by step photos. 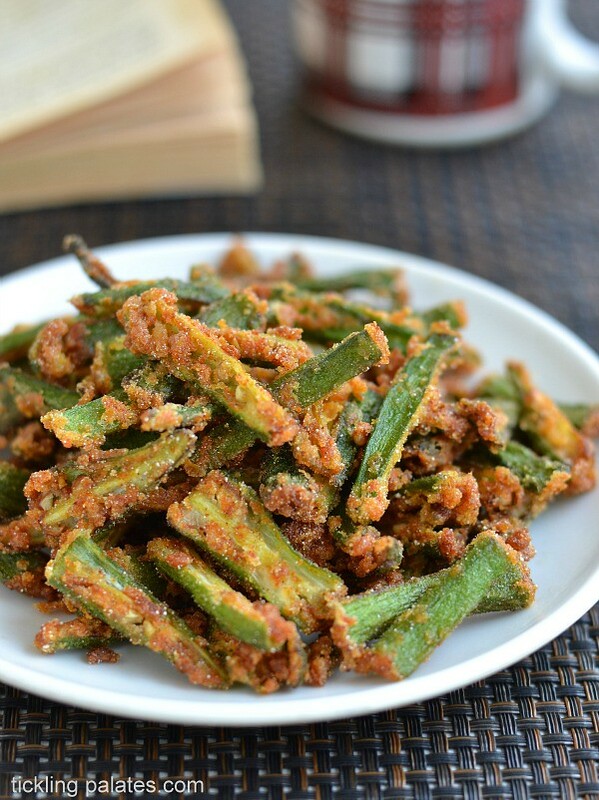 I love okra very much especially when made like this crispy fry. In hindi, the word Kurkuri means “Crisp”. Bhindi means “Okra” which is again called as “Vendakkai” in Tamil. Like the name suggests this is a crisp and crunchy dish that you can serve during tea time especially during the cold season. Also this recipe happens to be a no onion, no garlic recipe. The tangy spices added makes it lip smacking and delicious and not only that, there is no chance of a slimy mass that you sometimes get while making a curry or stir fry with okra. Though typically rice flour is not added while making these kurkuri bhindi, I have done so, as it helps to maintain the crunchiness of the okra for a long time even after deep frying. Apart from enjoying it as a snack during tea time, you can also serve these crisp fries as a side dish with rice especially pulaos. 1. Slit the Okra into slivers. Cutting them thin ensures that they get fried crisp and remain crunchy. 2. Spice the cut okra with dry powders and toss well for even distribution. 3. Sprinkle besan and rice flour evenly and mix with either spoon or hand. 4. Deep fry in batches till crisp and crunchy. Make sure you remove on to a kitchen paper to absorb excess oil. I have added 2 tsp oil while adding the spice powders, as it will prevent the okra from becoming sticky and watery as we are also adding salt. Adjust the spice powder according to your taste. Deep fry in batches, I cooked in 2 batches for an evenly cooked and browned bhindi. 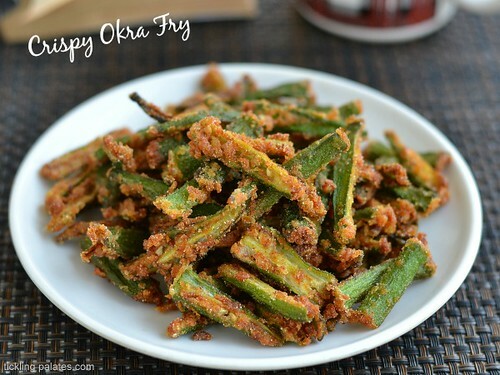 Kurkuri bhindi or crisyp okra fry with step by step pictures. Wash and dry the okra completely. There should not be any moisture present. Trim the edges. Cut the okra lengthwise and further slit them cross wise. Sprinkle chili powder, coriander powder, turmeric powder, chaat masala, salt, 2 tsp oil and toss well. Let it rest for 5 mins. Sprinkle besan, rice flour and asafetida over the okra slivers and once again toss well making sure it generously coats all the bhindi. Heat a pan with oil for deep frying. When the oil is sufficiently hot, drop the okra pieces in batches and cook it is roasted crisp and golden brown. Drain onto a kitchen paper to absorb excess oil and continue with the rest of okra. Crunchy munchy bhindis, love to munch some rite now. Simply mouthwatering and delicious to look at bhindi fry. Excellent preparation. this is my favourite way of making/eating vendakkai. good one. loved the clean pics radhika. Long time now. Hope all is well ! Your crispy okras will taste even better if you ajwain in the dry mix. can these be made without deep frying? If you do not want to deep fry, then you can either bake them, grill or if you happen to have an air fryer, you can use that too.